Canada’s WestJet achieved strong financial results during 1Q2014 despite challenges from currency fluctuations and the continued spool up of its regional subsidiary Encore. Its previous warnings of cost creep came to fruition, but despite that did not greatly diminish WestJet’s top-line results. The carrier is citing sequential improvement in its unit revenue performance, which has been a drag on WestJet’s performance during the last year as the airline has undertaken significant projects that it believes will ultimately shore up revenue over the long term. However, WestJet is refraining from issuing definitive unit revenue guidance, and is only assuring the trend of improvement will continue. As it works in the short term to restore unit revenue traction, WestJet’s closely watched evaluation of creating a long-haul operation appears to be inching closer to reality as it works to put all the pieces in place to extend its business model on a broader international scale. 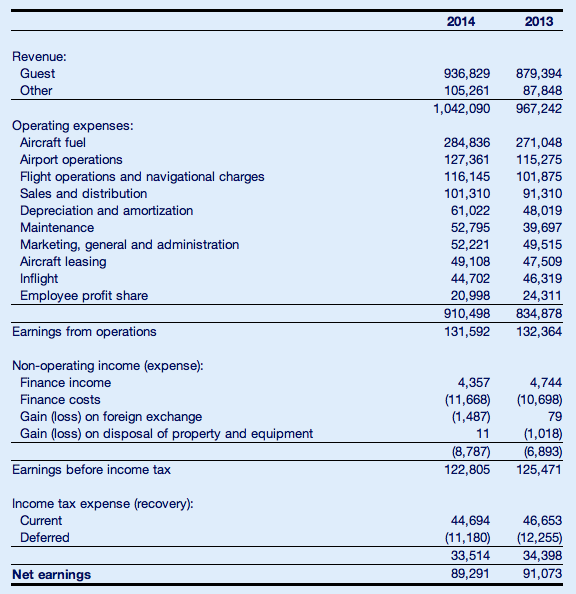 WestJet boasted that its 1Q2014 results were the second best 1Q performance in the company’s history even as its net income fell 2% year-on-year to CAD89 million (USD81 million). It was, however, the seventh consecutive quarter the airline exceeded its return on invested capital targets of 12%, achieving a 13.7% return for the 12M ending 31-Mar-2014. A 37% rise year-on-year in ancillary revenue to CAD50.7 million (USD47 million) helped lift WestJet’s top-line revenues by 7.7% to CAD1 billion (USD919 million). The jump in WestJet’s ancillary revenues was driven by pre-reserved seat sales and Plus seating and benefits from the co-branded WestJet RBC MasterCard. WestJet’s unit revenues remained essentially flat year-on-year, dipping just 0.2%, which is a sequential improvement from the 0.6% decline in 4Q2013 and the nearly 4% drop in 3Q2013. The carrier has been battling a soft unit revenue performance during the last year driven by its own capacity increases as Encore’s fleet grew to 10 Bombardier Q400 aircraft, and pricing pressure in some of its markets. As it discussed its 1Q2014 performance, WestJet declined to offer specific unit revenue guidance, other than stating that the improving trends of the three preceding quarters would continue. WestJet’s restraint in speculating on the remainder of the year is a odd considering the carrier’s commentary that overall demand is fairly strong, and it has been able to push through fare increases in certain geographies that can absorb the rise in prices. WestJet’s warnings of cost creep in 1Q2014 also materialised as unit cost excluding fuel and profit sharing grew 3.8% year-on-year. The carrier benefitted from nearly CAD20 million in the recovery of value added taxes from a foreign jurisdiction during the quarter. Absent the timing of that recovery, WestJet would have recorded a 4.3% rise in its unit costs during the quarter, which is in line with previous guidance of a 3.5% to 4.5% increase. The weakening of the CAD against the USD created some unexpected challenges for WestJet at YE2013 and during early 2014. The currency fluctuations triggered a CAD33 million headwind for the airline in 1Q2014. CEO Gregg Saretsky pointed to the fact that the rapidity of the currency challenges allowed little time for adjustments to be made. Previously, Mr Saretsky reasoned that WestJet could use ancillary revenue to offset some currency pressure including buy-on-board, change fees and its new Plus seating product. WestJet has however opted not to tag currency related surcharged onto its fares, opting to sustain its price transparency. Just prior to WestJet disclosing its 1Q2014 profit, Canada’s niche operator Porter Airlines opted to introduce a CAD25 fee for a first checked bag on its Canadian routes, matching a fee it institutes in its US transborder markets. The decision by Porter is fuelling speculation about a possible similar move by WestJet. Although WestJet has to tread carefully as its main domestic rival Air Canada told The Toronto Star it has no plans to add a first bag charge on flights within Canada. Air Canada does however charge fees for a first checked bag on US flights. During the past couple of years, WestJet has never ruled out charging for checked bags. During early 2014 Mr Saretsky concluded the carrier could not make a decision regarding such a charge until the proper technology was in place. Mr Saretsky is sticking to that message, noting the technological work was underway that would allow WestJet to add a fee for the first checked bag if the carrier opted to add a charge. He believes WestJet should have the technological capabilities in place by year-end; but obviously the carrier needs to evaluate the commercial and competitive implications of introducing a baggage fee. However, currency challenges and rising fuel costs, which increased 5% year-on-year in 1Q2014, may play a key role in whether WestJet opts to add a baggage fee into its ancillary options. Given Air Canada’s declaration that it has no intention of adding checked bag fees on domestic flights, it seems that if WestJet opts to introduce baggage charges it would likely add the fees on transborder flights. Otherwise, it could generate negative consumer sentiment by adding a fee that its major competitor has chosen not to adopt. Roughly a year ago WestJet floated the possibility of adding widebody aircraft in the medium term to expand its hybrid model – medium frills at lower price points – into longer-haul markets. It is scratching the surface in 2H2014 when it launches seasonal service from Toronto to Dublin via St Johns. Mr Saretsky said sales for the flights that start in Jun-2014 are doing so well that WestJet has extended the service end date by three weeks to late Oct-2014. The response to WestJet’s first trans-Atlantic market is giving the carrier confidence that there is demand for the value-based international product that WestJet is looking to pursue, said Mr Saretsky. WestJet faces competition in the Toronto-Dublin market from Air Canada’s new low-cost carrier rouge, which recently launched direct service in the market. Before its long-haul plans crystallise, WestJet needs to reach an agreement with its pilots that covers widebody operations - and obviously make the case to its board of directors. Mr Saretsky said WestJet is holding discussions with lessors and manufacturers regarding widebody aircraft, which could include the operation of Boeing 767s or Airbus A330s as early as 2015. A recent report in Canada’s Financial Post indicated the carrier’s management has held talks with pilots about operating those aircraft once an agreement with Thomas Cook, that entails a wetlease agreement for the operation of 757s to Hawaii, ends in 2015. Pilots from Thomas Cook operate the Boeing aircraft on behalf of WestJet. But Mr Saretsky stuck to WestJet’s original timing of a three-to-five year time period with respect to the debut of a widebody operation. He explained WestJet outlined the three-to-five year timeframe roughly a year-and-a-half ago, so “obviously” the carrier is now closer to setting its sights on long-haul service. While it seems WestJet’s widebody aspirations may be moving closer to reality, in the short term the carrier expects unit costs (excluding fuel and profit sharing) to grow 2% to 2.5% in CY2014 and is keeping its overall capacity projections of 5% to 6% growth for the year. WestJet embarked on 2014 with both unit revenue and unit cost challenges ahead, and even as the carrier believes some of the unit cost pressure will ease in 2H2014, it could be some time before the carrier restores its historical performance in those metrics. Its overall financial performance remains solid even as it has undertaken a raft of business strategy changes during the past year. Perhaps it would be wise for WestJet to ensure it has fully absorbed all of those changes before declaring even bolder plans to create a new long-haul network. But then again, there is never a perfect time all round.